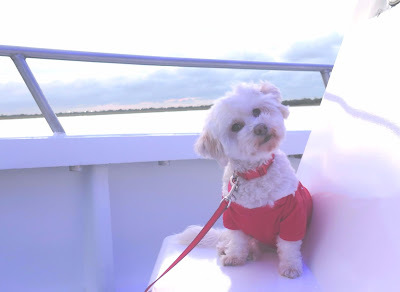 Have you ever taken your dog on a Doggie Sunset Boat Cruise? Some of you may remember me saying that one of my goals this Summer was to take my dogs out on a boat. Icy and Phoebe have never been on a boat before and that was one of my top adventure goals for them. But life got hectic and the Summer flew by so fast, I didn't make that goal. When I heard about a Doggie Sunset Cruise not too far from our house, it sounded like the perfect first step to finally getting my dogs out on the water! I had planned to take both Icy and Phoebe on the boat ride, but at the last minute I decided to take just Phoebe. I wanted to see what it was like before bringing Icy along. Phoebe is so easy, she only weighs 11 lbs and virtually nothing phases her. 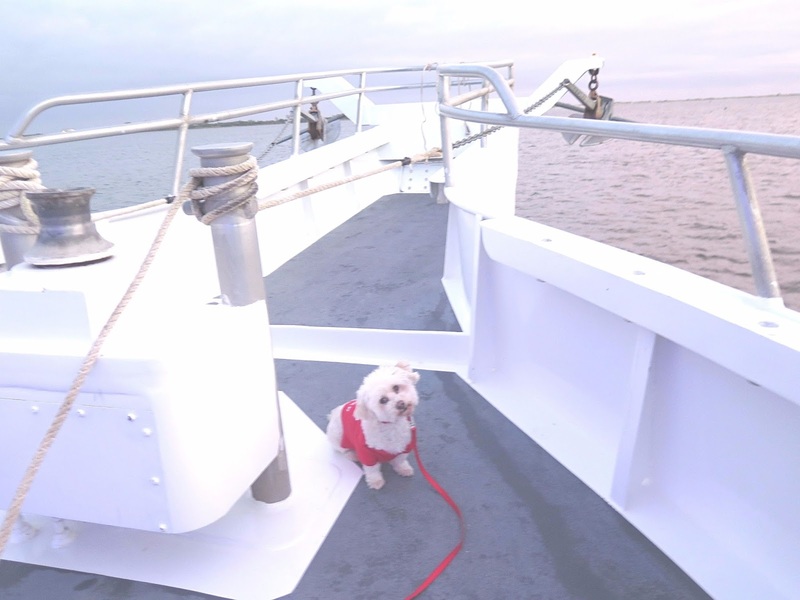 For a first step in getting my dogs out on a boat, I felt a larger boat with a smaller dog was the right way to go! 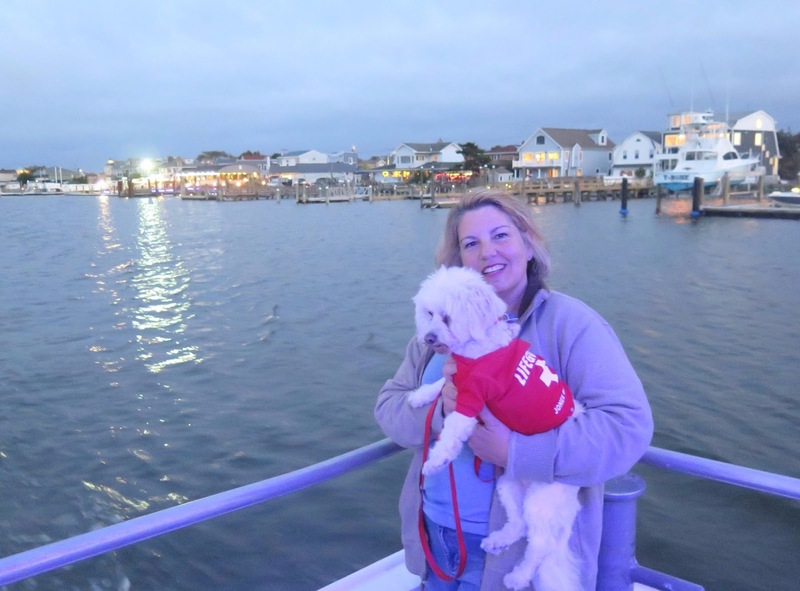 WHAT DOES ONE WEAR ON A DOG FRIENDLY BOAT CRUISE? I wasn't asking that question for me, I was wondering what Phoebe should wear? We had just been to Jones Beach a few days before and although it's end of season, the surf shop was still open. They had some onesies for babies on sale at half price - what luck! 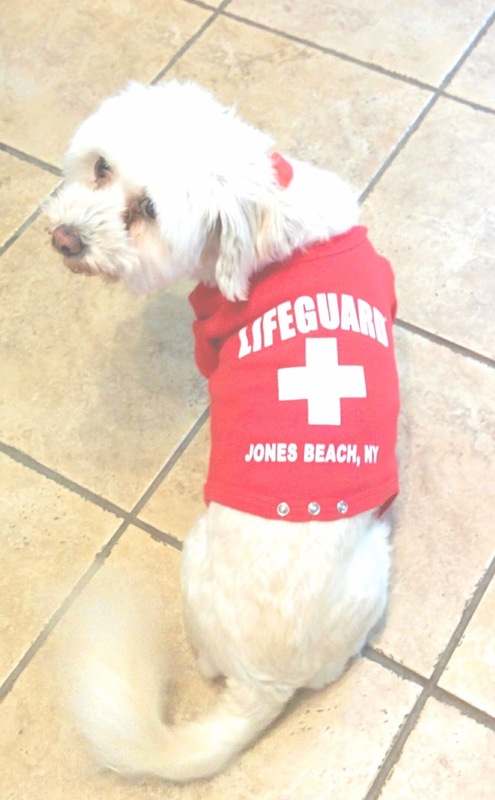 I found this adorable Jones Beach Lifeguard onesie in a 6 months size. I just cut off the bottom part that snaps and voila! Phoebe had a cute nautical themed shirt. Doesn't she look adorable!? I think red is her color. As we explored this part of the boat deck, it kind of reminded me of that famous scene in the Titanic movie - you know the one I mean! If I had a giant blue diamond necklace I'd have pitched it overboard, just for the romance of it! Standing out way out on above the water reminded me of the Titanic movie! 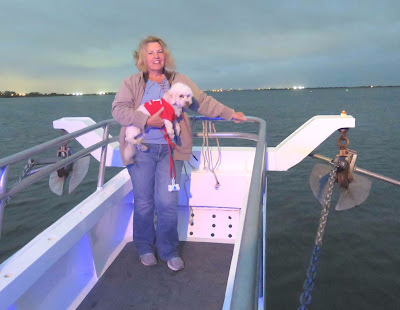 I didn't have a giant blue diamond necklace on me, so we just enjoyed the view from the front of the boat, the part that sticks way out into the water - I think that's called the "bulbous bow"? 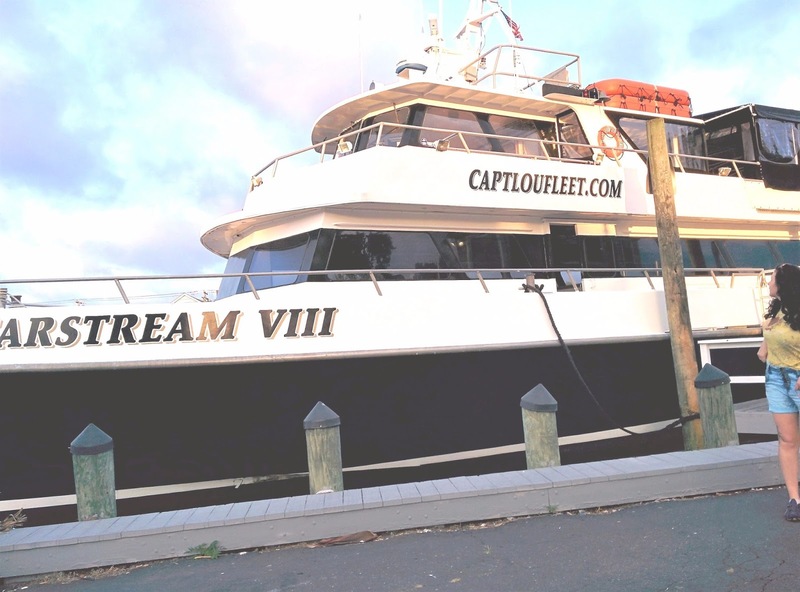 Any boat experts out there know if that's the right name for what we're standing on in these two photos? 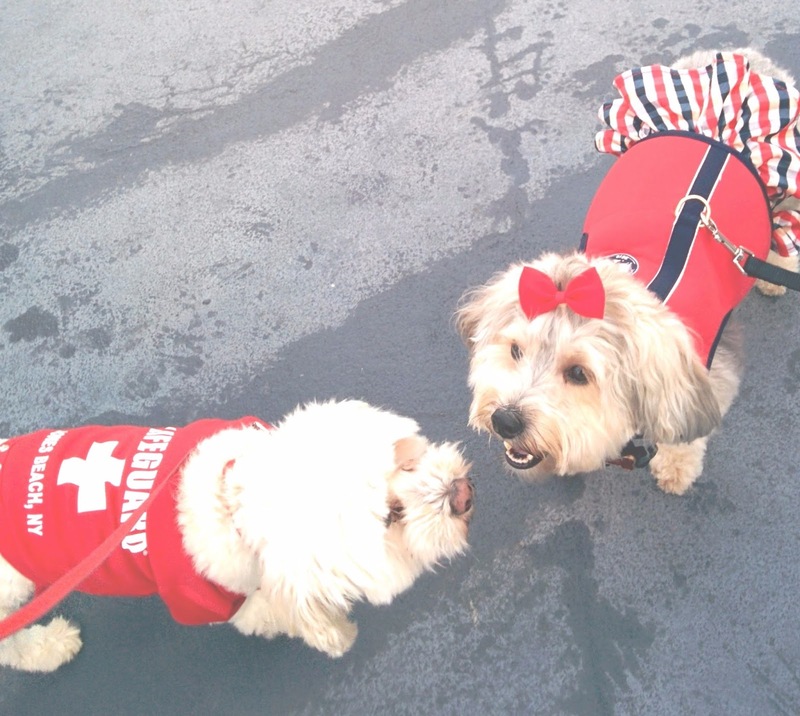 Phoebe loved meeting this beautiful little dog named Miracle out on deck. She's the sweetest girl! Phoebe made lots of other doggie friends too! Most of the dogs were really relaxed and friendly. Here's Phoebe chillaxin' with a small group of seaworthy dog friends she met on the boat. I loved that so many of the dogs were dressed in nautical themed outfits - check out the tiny sailor hats on the two Shih Tzu's on the right! I have GOT to get one of those hats for Phoebe's next ocean excursion! As the sun set, we cruised past the beautiful lights shining from homes and restaurants along the harbor. It was so calm and peaceful with the lights reflecting off the water. It was a little intimidating when we cruised under the drawbridge they had to raise for our boat to fit underneath it. Especially since they alert everyone with a really loud siren just before the bridge goes up - I didn't realize what was happening at first! I've lived on Long Island my whole life, but I honestly have never gone beneath a drawbridge as it was going up. It's pretty cool as you pass directly under the bridge and look UP! Although it was overcast that evening, we still saw a lovely sunset! I'm so glad we finally got out on the water with at least one of our dogs. I can't wait to go again, and I hope to get Icy on a boat soon too! ARE WE FOLLOWING EACH OTHER ON FACEBOOK AND TWITTER? IF NOT, LET'S GET SOCIAL! If you enjoyed this post, you may like my PET TRAVEL posts. I share tips and information from travel adventures with our dogs. You might find your next pet travel destination there! If you're taking your dog out on a boat, especially a smaller boat, check out these Boating Safety Tips for Pets. 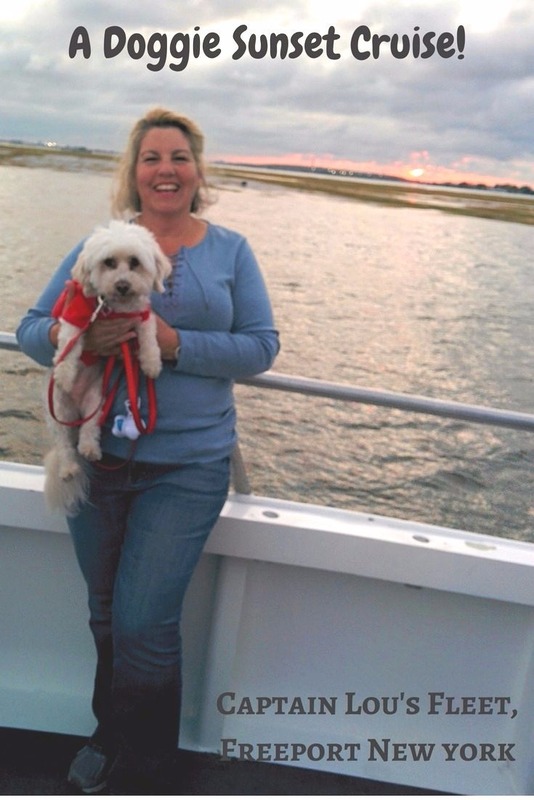 Have you ever been on a boat with your pets? Tell us about it in the comments. We love hearing about your pet adventures! What an awesome boat trip! Phoebe and Miracle look adorable together! I'd love to take the boys on a boat. Aren't they the cutest together! They were fast friends. I'm so glad I went on this boat ride. We almost didn't go because of overcast skies in our area (North of this bay) and an irrational fear of Hurricane Jose still several states away, LOL! I want to bring Icy on a boat ride too. Bentley & Pierre would probably love it. I've been on boats with dogs on them (https://dogtrotting.net/2015/09/10/travel-door-county-wisconsin-part-1-getting-doggie-sea-legs-on-a-fireboat/) on a former Fireboat in Wisconsin. But I've yet to take my Victor with me - other than when we rented a houseboat for four days. You rented a houseboat? That sounds so awesome! A former fireboat was probably really cool too. These are really unique boating experiences. Awe, this looks like so much fun! The pictures of both of you are adorable! I also love Phoebe will all her new friends! 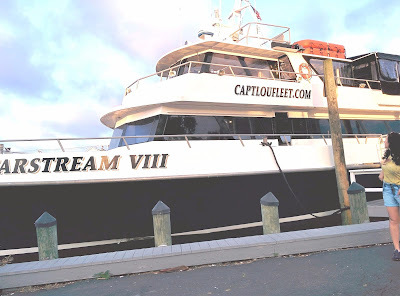 It was such a great time, I wish I'd known about this boat cruise earlier in the Summer! If the boat's big enough I think Ruby would be ok. Maybe bring her on in her carrier, then slowly let her come out to experience the boat. Aww. This is really nice Cathy! I would also want to spend time with my dog out on a boat.